Many of you already know this, but in case you don’t…I love me some budgeting! OK, I don’t love the actual budgeting part, because it is kind of a pain. And I don’t like the part where I don’t get to spend my money on what I want, when I want. But the results of budgeting (a debt-free life, for example)? We use cash envelopes to keep our budget on-track. You can read more about how to use cash envelopes here. And you can buy your own cash envelopes, our super popular Spend Well Budgeting System, here. But you can also make your own with this printable DIY cash envelope system! 60 Day Budgeting Challenge – this is *free* challenge that I run through email and an optional Facebook group. You’ll go from no budget (or one that you’re struggling with!) to a functional budget that you can live with and love in 60 days. How to Use Cash Envelopes – if you’re new to cash envelopes, start here! Our Debt-Free Story – we sold our house to pay off debt. Here’s how that all went down! How to Stay Out of Debt this Christmas – no matter what month it is right now, go read this post! OK, hopefully those budgeting resources might come in handy. 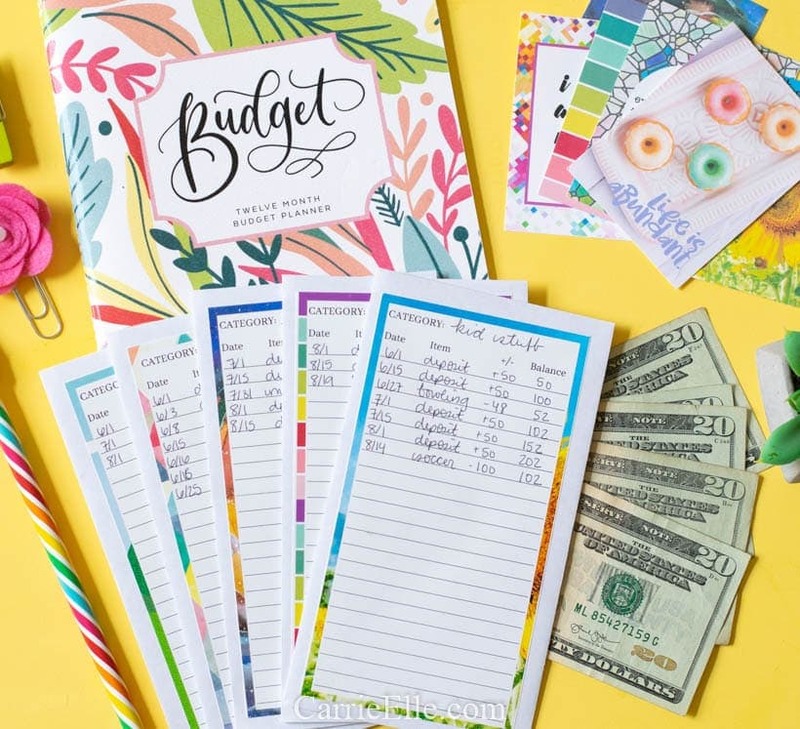 You can make your own cash envelope system with these cute printables! Here’s how to DIY your cash envelopes. It really is so simple. Determine how many cash categories you’re going to have (some examples would be food, clothing, pets, your own spending money, entertainment, travel, anything you’re saving up for). Grab an envelope for each category. Print out your labels on the sticker paper, cut them out, and stick to the back of your envelopes. As you fill your envelopes with cash, or remove cash from them, be sure to track every transaction on the label. Once you’ve filled it up, simply put another one on top of it and keep going. It’s so easy to get started…but wait until you see how great the rewards are you reap! There are 12 cute prints available – I hope you love them all! You can download them below. There’s a little download icon at the bottom of the downloads you see below. You might have to hover your mouse over the bottom of the download to see it. I think you’ll like the related posts below, too! Pinning, That was a great idea and a lot of inspiration thanks. You’re welcome!! Thanks for pinning! International shipping is the worst! I wish we could find a way to do it cheaper!